A DC Power System is used to provide uninterrupted DC power to telecom, utilities, railroad, renewable or any other type of equipment requiring DC power. These systems create an extra layer of protection for the equipment being powered. We are a distributor of GE Critical Power & DC Power System products and can offer any size system required to fit your power needs. Small Power Plants provide up to 3000 Watts of power, or 60 amps at 48VDC, only taking up 1RU of shelf capacity (approximately 1.75in) and are lightweight,. They have an efficiency rating of up to 95% depending on the load size. Medium Power Plants provide power up to 65,000 Watts, or 1200 amps at 48VDC, capable of supporting dual voltages, providing power to both +24 and -48 equipment at the same time. Medium plants provide a larger amount of distribution compared to small power plants and have an efficiency rating of up to 97%. 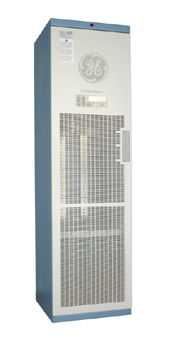 Large Power Plants provide over 960,000 Watts in an integrated multi-cabinet configuration, which is 20,000 amps at 48VDC. These systems are capable of receiving AC power from 3-phase 208/240VAC or 480VAC inputs. Large plants have efficiency rating approaching 97% and are specifically designed for small, medium, or large data scale centers. A rectifier is an electrical device that converts alternating current (AC), which periodically reverses direction, to direct current (DC), which flows in only one direction. These devices are the core component of a DC Power Plant. DC Distribution Equipment is used to divide and isolate individual loads from a primary power source (commonly the power plant). The main benefits for additional DC distribution is the ability to feed more loads to more equipment.